Elotes. Mangonadas. Pepinos con chile y limon. Fresas con crema. Mangonada from Hay Elotes. Credit Clarissa Perez. Elote is Spanish for corn. You’ll get a nice serving of corn in a cup, and you’ll choose from a variety of spices and chilies to add to your cup. For first timers, a safe bet is: butter, a little mayo, parmesan cheese, tajin or any chili powder, some Valentina hot sauce, and a dash of lemon pepper. Be sure to mix your corn to get an even distribution of flavor. The fun thing about elote is that you can season it to your liking. 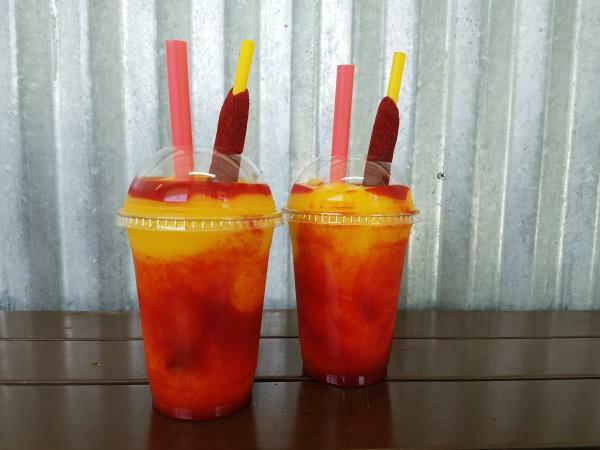 Mangonada is a Mexican fruit drink typically made with mangos, chamoy sauce, lime juice, and chili powder. For a sweeter mix, top your mangonada with fresh strawberries and sub the chamoy sauce for a sour belt. You can mix sweet with a little bit of sour for a drink that will keep you cool on a warm day. Pepinos con chile y limón translates to cucumber with chili powder and lime juice. This simple snack is a hit especially with the kiddos. The cucumber is typically completely peeled then sliced and laid flat on a plate. You can then season the cucumber with some fresh squeezed lime juice and some chili powder. Not sure if you’ll like the chili powder? Sprinkle some of the side of your plate and dip the cucumber in it. Want a little more kick? Add some hot sauce to your pepinos con chile y limon! Fresas con crema is a deliciously sweet treat of strawberries and cream. The cream is a mix of condensed milk, Mexican sour cream, and sugar. Once the cream mixture is nice and sweet, diced strawberries are added. You can top of your fresas con crema with whipped cream, chopped nuts, and more fruit such as blueberries or raspberries.